Whether your days are full of homeschooling adventures or they’re full of wrangling kids and running your household, you’re going to have to serve dinner at the end of the day. Feeding a large family can be extra challenging when you’re busy. These large family oven dinners will help you feed your family a healthy meal without a lot of prep work. 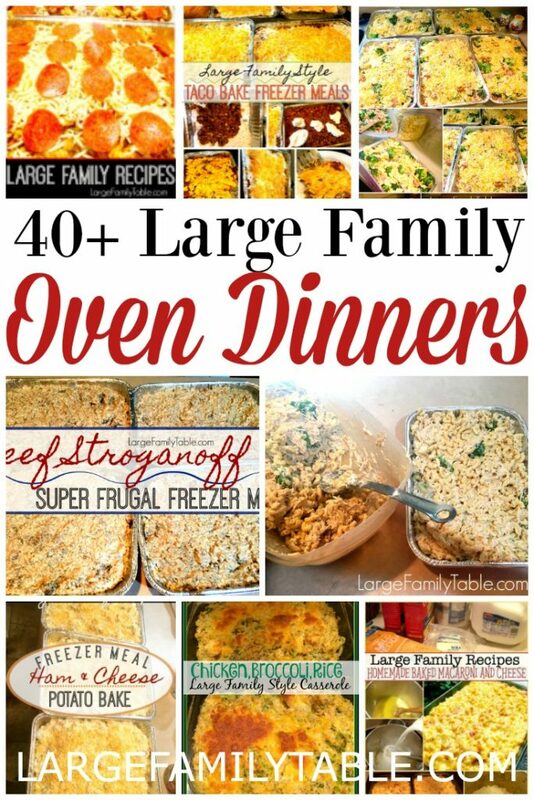 I hope you enjoy this massive collection of 40+ Large Family Oven Dinners! Several of our family’s favorites are on this list. This hearty hamburger patties recipes will help you whip up some thick and hearty burgers for those times when nothing but a burger will do. If you have never considered making things like tuna cakes for the freezer, let me assure you that they turn out great! This pizza casserole oven bake might just be the next major favorite at your large family table! Top it with your family’s favorite pizza toppings, and it’s sure to be a hit. Speaking of pizza, how about making several batches of homemade freezer-friendly pizza dough. Thaw the dough overnight, and you’ve got the prep work done for tasty homemade pizza for dinner. 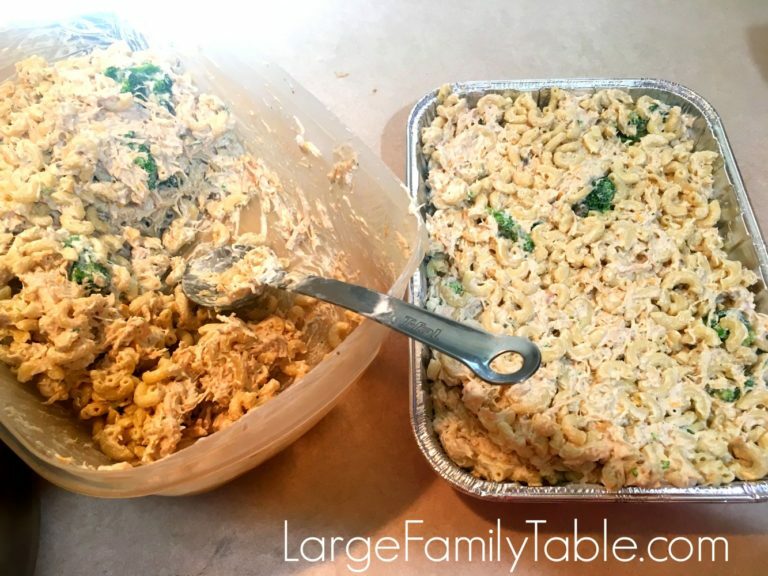 There’s tons of room to customize and adapt this recipe for Chicken Alfredo Broccoli Casserole. It’s super cheesy and creamy, and it pairs well with any side dish you choose to serve alongside it. My version of Chicken Tater Tot Casserole is a tasty twist on an old favorite. My whole family gobbles up all the yummy goodness! If your family loves ham, cheese, and potatoes you will want to double this Ham, Cheese, and Potato Bake. That’s what I do! This easy Taco Bake can be made with taco shells or tortillas. Either way, it’s sure to be a hit on your next Taco Tuesday! Homemade Macaroni and Cheese is such a versatile dish. You can serve it as a main dish with veggie sides or as a side with hot dogs or hamburgers. And this recipe makes enough to feed your whole crew. 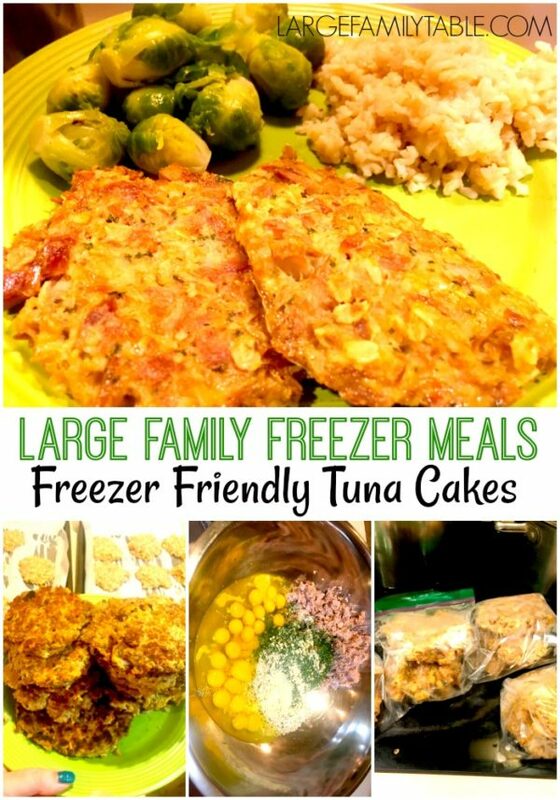 It’s a must on the list of large family oven dinners! Kielbasa and Cheese Broccoli Bow Tie Bake is a super frugal meal that’s perfect for summer. You can make multiple pans and eat one tonight while saving the rest for another busy day. I love Beef Stroganoff, and have been making some version of it for about 20 years. It’s frugal and easy to customize with your family’s favorite meat. You can feed a herd of hungry people with our favorite Baked Ziti recipe. Add your favorite side dishes, and make it work for your family. Homemade Lasagna is easy to adjust to meet your family’s needs. Add more meat to make it more filling or less meat for frugality. Either way, this recipe makes enough to easily feed your large family. It’s easy to prepare Chicken Enchiladas ahead of time. Serve some tonight and freeze the rest for later. Customize them with your favorite filling – beans, rice, etc – and serve with your favorite Mexican sides or steamed veggies. Burgers are an easy dinner to prepare. But, sometimes you don’t have time to fire up the grill. Foil Packet Burgers will let you serve burgers for dinner without the added hassle of the grill. Chicken, Broccoli, and Rice Casserole is a favorite at my house. I make it at least once a month. 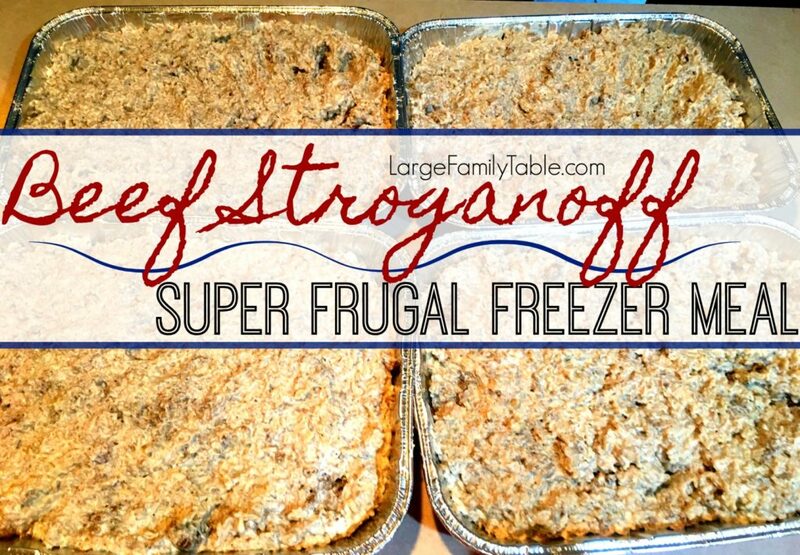 It’s easy to double so you can serve it tonight, and freeze one for another night. Busy families on the go will love this easy Sloppy Joe Casserole. It’s simple enough to throw together at the last minute. If you have a large family, it’s important to have a stash of recipes that are easy to cook. This Cheesy Bacon Chicken Casserole is tasty and scravingsofalunatic.com/sloppy-joe-casseroleimple to make. These delicious Salsa Verde Chicken Enchiladas are sure to become your family’s favorite Mexican recipe. You can use leftover chicken or a rotisserie chicken to save time. I’m of the opinion that barbecue sauce makes everything better. This BBQ Meatloaf recipe goes in the slow cooker for a low-prep large family oven dinner. If you’re short on time and looking for a budget-friendly recipe to feed your family tonight, check out this Baked Spaghetti recipe. You’ll need to double (or even triple) this recipe to feed your large family, but they’ll love it. When you mix up a batch of Homemade Meatballs, you will have the start of quite a few meals. Spaghetti and meatballs. Meatball subs. Swedish meatballs. And so much more! While this recipe for Homemade Chef Boyardee Beefaroni only feeds 6, it’s super simple to double or triple it to feed your large family. If your family loves cornbread, be sure to have several loaves of Homemade Cornbread in the freezer so you can pull it out and enjoy it any time you’d like. Homemade Cornbread goes wonderfully with a variety of large family oven dinners! This Pork Chop and Hashbrown Casserole recipe is quick and easy. Throw the ingredients in a dish, toss it in the oven, and dinner will be ready in no time. What foods take you back to your childhood? Tuna noodle casserole is one of mine. It’s quick and easy to put together, and it’s easy on the budget. Best of all, you can double or triple it for your large family, and you still won’t break the bank! This Chili Mac recipe is inexpensive and cooks up quickly for busy nights. Double or triple the recipe to suit your family’s needs or to ensure you have leftovers for tomorrow’s lunch. Million Dollar Casserole looks like a quick twist on basic lasagna. Using penne pasta, this creamy pasta dish is perfect for tonight’s dinner and a few extra pans for the freezer. Speaking of lasagna… take Taco Tuesday to the next level with a batch of Mexican Lasagna. It’s easy to adjust the amounts if you want to make extra to put in the freezer for a busy night. Whether you call it Cottage Pie or Shepherd’s Pie, you’ll want to whip up several pans of this freezer-friendly meal to feed your family tonight and in the weeks to come. These easy stuffed bell peppers are a great way to serve your family a good amount of healthy vegetables for dinner. Cook up a batch of chipotle chili in your slow cooker, and then serve on top of baked sweet potatoes for a tasty dinner on a cold winter night. Bean, rice, and cheese burritos are great to add to your list of large family oven dinners! They’re quick and easy to make, and they freeze wonderfully. Chicken pot pie is a traditional meal that is easy to adjust for the size of your family. You can use the recipe here to make your own crust or use a refrigerated crust for convenience. Busy moms are often on the hunt for easy recipes to simply dinner prep. This chicken potato casserole is perfect because it relies on store-bought rotisserie chicken for a low-prep dinner option. King Ranch chicken casserole is a comfort food classic. it combines layers of chicken, tortillas, and cheese for a cheesy casserole that is sure to please even your pickiest eater. This loaded baked potato chicken casserole is perfect for weeknight family dinners, and it’s sure to become a family favorite. This bacon cheeseburger tater tot casserole is sure to please the entire family. It can be made ahead of time and frozen for later. Then, pull it out on a night when you don’t have time to cook a meal from scratch. Three cheese baked penne casserole is a quick and easy meatless meal that can be made ahead if you’d like. This chicken noodle casserole tastes like chicken alfredo. 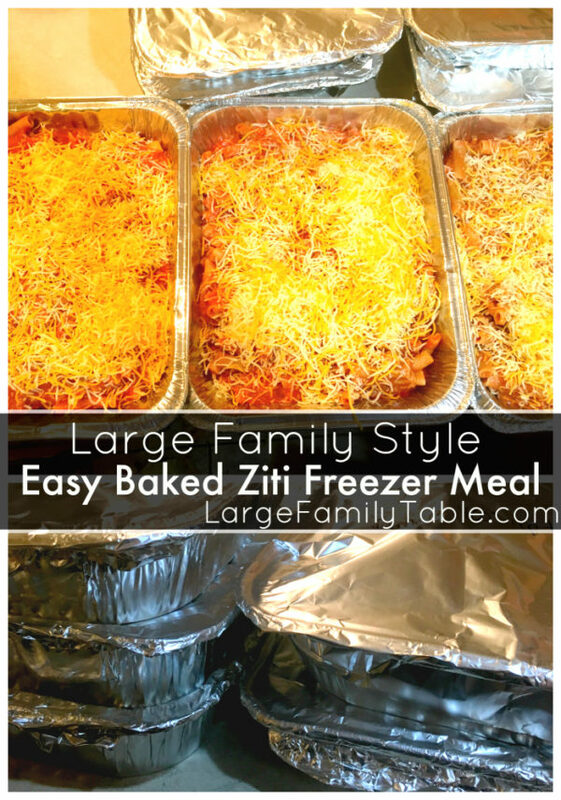 It’s perfect for your next family dinner or potluck! You can take an old classic and put a new twist on it when you serve this chicken and dumplings casserole to your family. Make this chili spaghetti casserole ahead of time and refrigerate it or freeze it for a busy night. 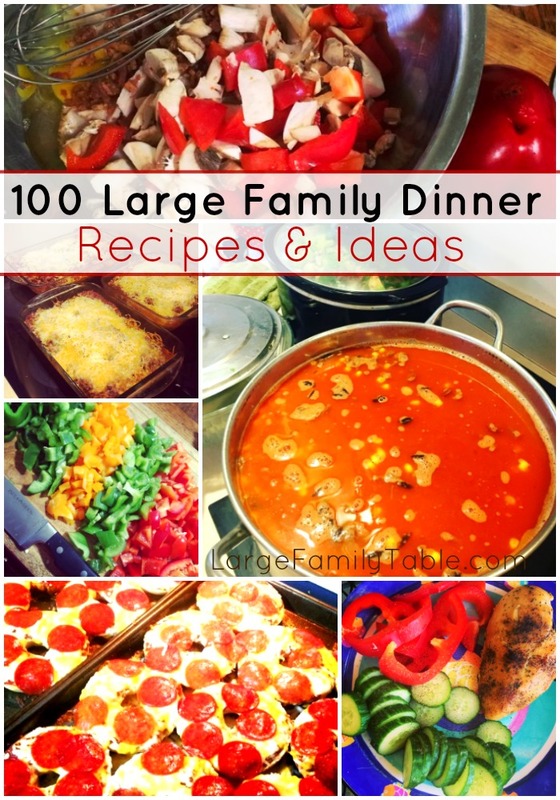 Here are over 100 Large Family Dinner Recipes to help you get dinner on the table! And here are 25 Quick & Cheap Large Family Slow Cooker Recipes. Please be sure to share your favorite large family oven dinners in the comments below!